as wife and mother she was all that one could be. 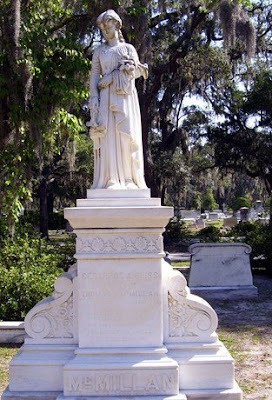 Gertrude was born in Savannah to James S. and Julia C. Bliss. She seems to have been a member of a wealthy family. In the 1870 Chatham County federal census, Gertrude's father had an occupation of "Pilot," and there were three domestic servants listed in the household. 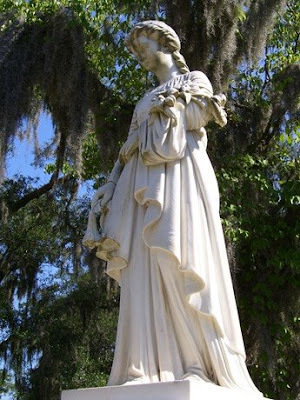 Gertrude married Thomas H. McMillan, a prominent Savannah businessman about 1882. They had four children: Daniel B., Thomas H. Jr., Alice B., and Raymond. According to the 1900 Chatham County federal census, Thomas Sr. was a turpentine manufacturer, born 1854 in North Carolina. From A History of Savannah and South Georgia, Vol. II by William Hardin, published 1913 - "Mr. MacMillan married, in Savannah, Gertrude Bliss, who was born and educated in this city. Their union has been blessed by the birth of four children, namely: D. B. MacMillan, who has charge of the MacMillan interests in Pensacola; Thomas H. MacMillan, Jr., connected with the Savannah plant; Raymond H. MacMillan, representing South Atlantic Blow Pipe Company in Jacksonville; and Miss Alice MacMillan." Gertrude's stone is also profiled in Douglas Keister's Forever Dixie: A Field Guide to Southern Cemeteries & Their Residents. Beautiful stone!!! Love that story! I am going to get that book. It is a beautiful stone. I can't wait until I can make it back to Bonaventure again... I haven't made it all the way through the book, yet. I sure do like it, though. He profiles a dozen southern cemeteries. It is highly unlikely that this statue is the likeness of Gertrude Bliss. 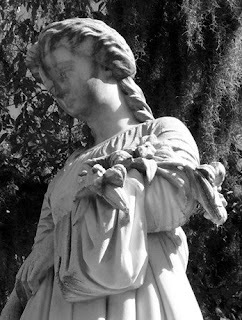 There is a statue just like it in Laurel Grove South in Savannah, Ga.